Graduates from the Texas Academy of Dental Assisting enjoy great new jobs in the dental field. Some find new jobs before they graduate and start early on a fulfilling new dental assistant career. Double praises to students Kassi F. who was working for Petsmart and student Jennifer B. who was working as a medical assistant. They came to the school with aspirations of being dental assistants. These two over achievers were hired BEFORE they graduated by the same oral surgery and dental implant office. Our Texas Academy of Dental Assisting instructor team is on cloud nine rejoicing in their success. Best wishes ladies. We miss you both! Congratulations to Taylor C. who was working as a clothing associate as she was researching a career change. We are overjoyed to announce upon completion of our school… she is now working as a RDA registered dental assistant for a general dental office. Taylor we are very proud of you and wish you the best success! Want to be like these ladies and join a recession proof career? 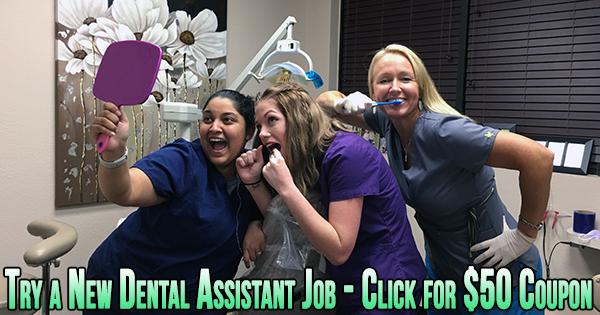 If so, then take advantage of this opportunity and get a spot in our next Dental Assisting class while there is still room… Email or call us today!